Aaron Sorkin is arguably one of the best screenwriters in the world. From the early days at The West Wing, to The Social Network, to Moneyball, to Steve Jobs, his quick witted and sometimes bruising dialogue often feels like some sort of intellectual high wire act. For his directorial debut, Sorkin chose Molly's Game, an adaptation of a memoir by Molly Bloom (Jessica Chastain), a former Olympic skier who ran high stakes poker games in Los Angeles and New York before being arrested by federal authorities for involvement with the Russian mafia. Sorkin examines how she got to that point utilizing a flashback structure, as she reflects on her journey to the top of the underground gambling world to her lawyer, Charlie Jaffey (Idris Elba). Arrested for skimming profits, Bloom finds herself arrested again two years later after the publication of her memoir in an effort to go after larger figures in the mafia who had become embroiled in her games. While Bloom insists she had no idea, Jaffey is skeptical, and pushes her to examine the truth behind her rise to prominence and her subsequent fall from grace. 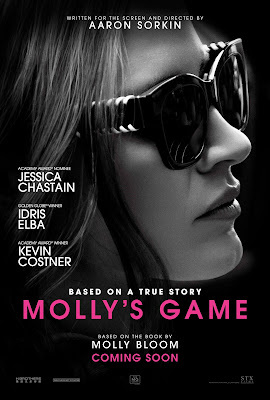 Molly's Game paints a picture of a woman from a family of overachievers always trying to impress her hard-nosed father, Larry Bloom (Kevin Costner). Chastain knocks her role out of the park, using her poise and confidence as a mask for deep inner turmoil and a lack of self-esteem. Yet Sorkin tries too hard to psychoanalyze Bloom in the broadest possible terms. The "daddy-issues" subplot ends up feeling like a narrative shortcut rather than solid character development. Sorkin's skills with dialogue are on full display, but as a director, I think he misjudges the heart of the film. The dialogue often acts as a mask that we are never really able to peer behind, holding the audience at arms length from the characters. The flashback structure also undercuts a lot of the film's dramatic power; since we already know where this ends up for the most part, there's little tension to be found here. Molly's Game is a film that feels very satisfied with itself, but never really displays any reason to be. 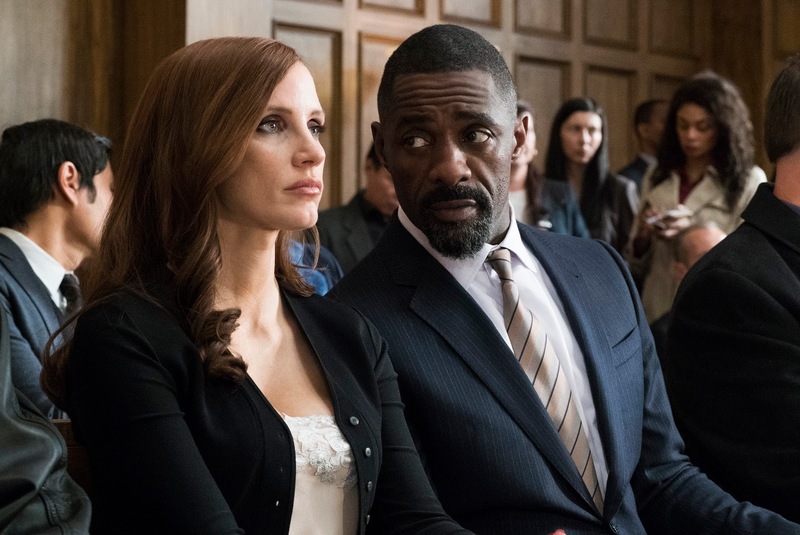 Chastain and Elba are both at the top of their respective games, and Sorkin's dialogue is as sharp as ever. But he never really gives us as a reason to care about anyone involved. When the structure constantly undercuts any emotional or dramatic thread, the film becomes detached and aloof, seemingly coasting on a pedigree rather than grounding itself in real human emotions. It's a fantastic facade, to be sure. Bloom doesn't want to care what anyone thinks, even though deep down she really does. The film is the same; it focuses on the elaborate ruse of success created by Bloom, but fails to connect with who she really is. Sorkin's scripts have come to life with filmmakers who know how to balance their particular brand of arch wit with emotional weight; witness what David Fincher did with The Social Network, or Bennett Miller with Moneyball. As a director, Sorkin just doesn't yet have the stylistic chops to really make it work. The elements are all there, but they never really come together in a satisfying way. Chastain may act the hell out of this, but without the proper emotional grounding on the part of the filmmaker, she's left with an unlikable character without solid grounding in anything that resembles real feelings. MOLLY'S GAME | Directed by Aaron Sorkin | Stars Jessica Chastain, Idris Elba, Kevin Costner, Michael Cera, Brian d'Arcy James, Bill Camp | Rated R for language, drug content and some violence | Opens today, Dec. 25, in select cities.